Using a night cream is always essential for our skin as our skin repairs at night. A night cream helps in the working of repairing the skin cells at night and it enhances the skin texture. There are so many night creams are available in the market, but not every person will use it, as some of them don’t suit the skin type and the budget. So, here is some easy homemade night Cream. So, here we are to help you with this problem too. 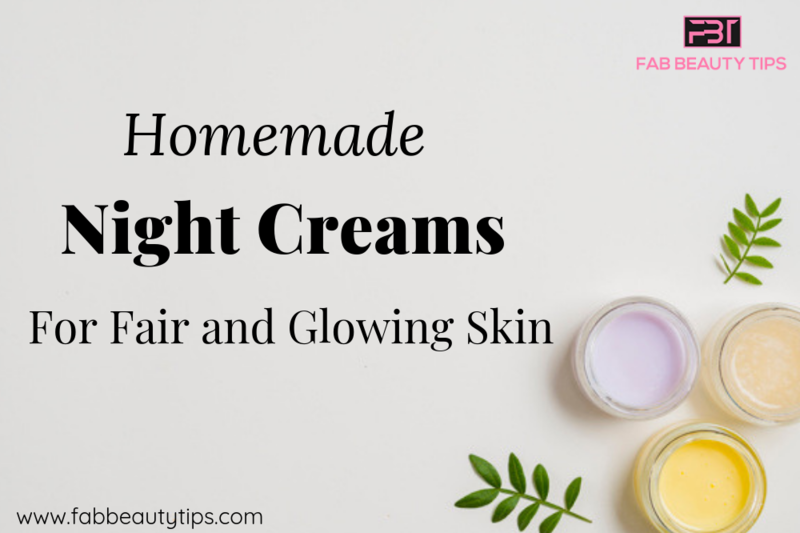 We listed some night creams which you can make on your own at home and with very less expenditure. Mix a few drops of almond oil and coconut in a bowl. After mixing add few drops of rose water and mix it nicely. Apply this cream on your face and neck after cleansing your face. You can store this cream up to seven days in the fridge. Rosewater helps in hydration and almond oil provide the nourishment of vitamin E which make skin glowing. In a bowl add almond powder and turmeric powder. Mix both the powder well and add rose water in it. Now add a few drops of almond oil in it. Mix them well and apply it on your freshly washed face and neck. Store this cream in an airtight container and use this for 10 days. Almond powder helps in cleansing the skin well and moisturize it well, while turmeric helps in to lighten the complexion. Add apple pieces into the grinder and make a smooth paste of it. Now add olive oil, rose water and pinch of cinnamon to this mixture. Mix it properly and store it in an airtight container. You can use this up to 7 days. Apples are rich in vitamins A, B, and C, antioxidants which make skin fair and young. It also repairs the dull skin. Mix all the oils and beeswax in a glass bowl and heat it until it is melted. Poke the vitamin E capsule and add it to the mixture. Let it set aside to cool down. Store it in a container and use this up to 2 to 3 months. Olive oil is a great source of moisturization and helps in treating the dry skin. Take a double boiler and add coconut oil in it for melting. Now take it off and add rose water and glycerine in it. Mix it well and store it in a container. Use this daily after washing your face. You can use this for about a week. Glycerine helps to hydrate the skin and also maintains the moisture in the skin. It also heels the dry patches popping on the skin. Add all the ingredients in a double boiler and heat it up until all the oils melted and mixed well. Remove it from the heat and cool it down. Transfer the cream in a container and store it in a cool place. Use this daily and up to 1 month. Cocoa butter works best for dry, dull and chapped skin. It moisturizes the skin well and also treats wrinkles. Mix almond oil and beeswax in a glass bowl and place it over a double boiler. Mix the remaining ingredients to this and let it cool down. Store this in a clean container and up to 1 month. Green tea removes the impurities and pollution from the skin. Beeswax is used to make creams and to moisturize the skin. Take out the gel from the aloe vera plant and grind it in a mixer. Now add tea tree oil in it and mix well. Transfer it in a container and use it daily. Aloe vera is best to use for acne and pimple. It also reduces the blemishes on the skin. It nourishes the skin and makes it soft and supple. Mix all the ingredients and whisk it really well to form a smooth cream. Transfer this to a container and use it daily after washing your face and neck. You can store this up to 7 days. Milk cream has lactic acid which is known to lighten the color and it moisturizes the skin very well. Mix aloe vera gel and sandalwood paste in a bowl. Add few drops of rose water in it and mix well. Apply this cream all over your face and neck after cleansing. You can use this cream for 10 days. Sandalwood helps in getting the light and bright complexion after a few uses. It also hydrates the skin and treats acne problem. Mash the avocado and add yogurt to it. Now blend them nicely to make a smooth paste. Apply this cream twice a week after washing your face and neck. Store it in an airtight container up to a week. Avocado is rich in vitamins and antioxidants which makes it perfect to use for dry skin. It moisturizes the skin well and makes skin glow. Make a smooth paste of overnight soaked almond by blending them in a blender. Now add turmeric and few drops of lemon to it. Mix them well and apply it twice a week on your face and neck at bedtime. You can store it for about 2 weeks. Turmeric and lemon help to lighten the skin complexion and treats dark spots and pigmentation. Take a bowl and add purified butter with honey. Now stir them well until it forms like smooth cream. Apply this all over your face and neck. Massage it for 10-15 minutes and sleep. Store this cream for 5 days and make a fresh one after this. Butter provides the hydration to the skin and honey helps to maintain the moisture level in the skin. Crush the orange peels and add it to the blender or mixer along with the petroleum jelly and glycerine. Mix it until it you get the face pack like consistency. Apply this on your face and neck before going to bed, every night. You can store this night cream up to 2 weeks. Orange is loaded with vitamin C which is a good source of moisture and also treats the discoloration and dry skin. Take a bowl and add aloe vera gel in it. Now poke the vitamin E capsule and add the oil in the gel. Mix them well and now add few drops of essential oil. Mix it nicely and apply it to your face and neck. Store this cream up to 1 week. These are some really easy but effective night creams which you can make at your home without spending much money. Try these and make a difference in your skin. I am very happy to read about all these different kinds of night creams. Thank you for assembling all this information in one place. I, ve heard of DIY face masks but never have heard about DIY night cream. This would be a boon for our skins. Thanks for sharing these awesome recipes. I never thought we can make face creams at home! This is amazing! I am surely going to try the apple night cream! It’s great idea to formulate a night cream as you can put desired ingredients into the cream. Also it is an economical option. Thanks for sharing .